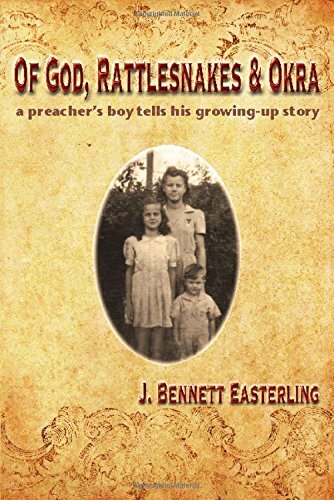 “Of God, Rattlesnakes & Okra” by J. Bennett Easterling is the compilation of stories about living in the south and growing up as a preacher’s son. These stories had me laughing, crying and wishful for a return to a time when families lived by hard, honest work, respect for family, and a deep faith. The author’s tales of roaming the farm, raising animals that became our heroes, and living on what they could barter for reminds me of my family – nothing was given without earning it and everyone deserved help regardless of race, religion or beliefs. I laughed about the stories of Ben’s mother using Carter’s Little Liver Pills and castor oil to fix all ills. And of course, how all mothers have eyes in the back of their heads. Ben’s father was a jack of all trades. He did whatever was necessary to provide for his family, his jobs included traveling preacher, trapper, raising bees and selling honey. Many times he gave away his last dollars to help others and never once showed anger or desperation about what he would do. The stories are full of love, family history, learning life’s lessons through trial and error, and parents who set a good example. One such lesson addressed not realizing you made a racial slur or were offensive to a person. I loved that if you did offend someone you were gently reminded to respect others and treat them as you would want to be treated. Reading this epic story made me feel like I was sitting on a log or on the porch having a chat with the author. One can just visualize having a mule chase them, raising a prized pig, or asking straight-forward questions of older sisters’ boyfriends. After finishing “Of God, Rattlesnakes & Okra” by J. Bennett Easterling, the lessons learned, family love and gentle but firm childrearing will have a long lasting impression. I enjoyed re-living a childhood before technology, bullies, welfare and hate crimes. It was refreshing to be reminded that one can create memories with the simplest things. Even today the author and his family still enjoy going back home to revisit his old stomping grounds and incorporating past family traditions with his children and grandchildren.